Just in time for St. Valentine’s Day, a story of Catholic LGBT love from Ireland! 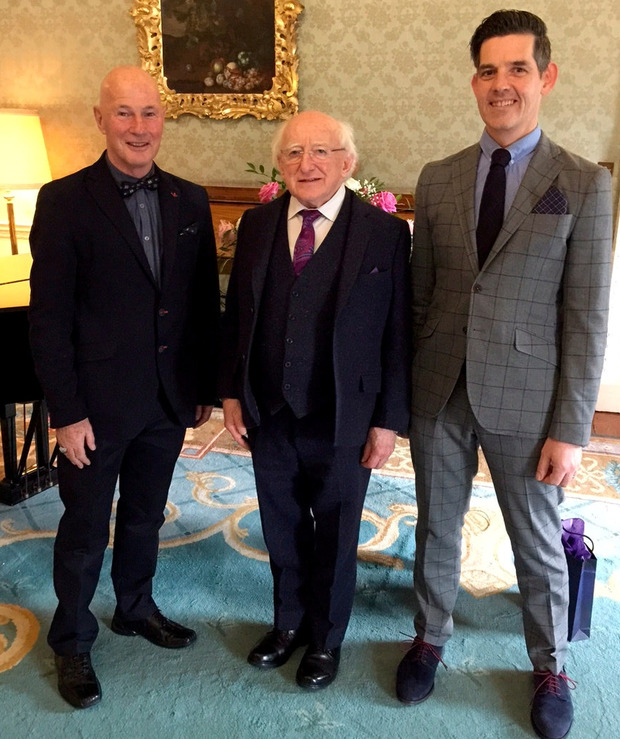 The Irish press was all abuzz recently with the news that two gay Irish men, one of whom is a Catholic priest tied the knot in County Clare, exercising their right to marry thanks to a national referendum in 2015. The two had already had a civil union over 10 years ago. According to The Irish Sun, Lynch was the world’s first Catholic priest to have a civil partnership. The couple has been together for 23 years. In the 1990s, Lynch had been among the first delegation to meet with a president of Ireland (at the time, Mary Robinson) at the Aras an Uachtarain. While living in New York City in the 1980s, Lynch was a pioneer in Catholic outreach to the LGBT community, particularly to the segment of the population living with HIV/AIDS. It’s very true that all love is magical and spiritual. That’s what we celebrate today. Happy St. Valentine’s Day! Wonderful story. Congratulations to them both. And, he should consider himself ordained and he should continue to function as a priest on his own. What can the church possibly do to him? This is how it starts. Just keep going forward. So encouraged by reading this. Thank you! I remember Bernard Lynch giving powerful homilies at St Francis Xavier Church at Dignity Masses in the 80s. He stood up for real Catholic values at a very prejudicisl time that still exists in the Church. Ad multos annos. I experienced my personal melt down in 1960. I was 23 years old and a sophomore in dental school. (I had become aware that I was gay at age 12 and in sixth grade.) In the 1960’s coming out to parents or friends was not an option. Yet I knew that I was in crises mode, and that I needed professional help. I told my mom that I had a severe social psychological issue and that I needed to see a professional counselor. I remember going to the initial appointment with a psychiatrists as if it were yesterday. Telling him that I was gay was the most difficult thing that I had ever done. After that initial evaluation, the psychiatrists suggested that I would best be served by consultation with his associate who was a psychologist. And so began a three year process of finding out who I was. My psychologist used a method called client centered therapy. It was all about what made Don tick. I had no idea of how fortunate I was to have found a progressive doctor like him in the 1960’s. I also remember well the last appointment that I had with Dr. Olivera. I said, “It seems that no matter how this comes out, if I see an attractive man its going to turn my head.” The doctor confirmed my observation. My response was, “If that’s the case then I’m going to be the best gay person that I can be,” and I walked out of the office. I’m sure that it was no coincidence that Dr. Olivera received his formation at Saint Louis University, a Jesuit university. I am now 80 years old, and as look back on my life, those three years of therapy turned out to be a pivotal experience in my life. It gave me the freedom to be myself. I gave myself the permission to come out within. Although, society at that time and my quest to experience a military career as a dentist in the US Navy required that I remain in the closet until the end of Don’t Ask, Don’t Tell, Tuesday 20-October-2011.